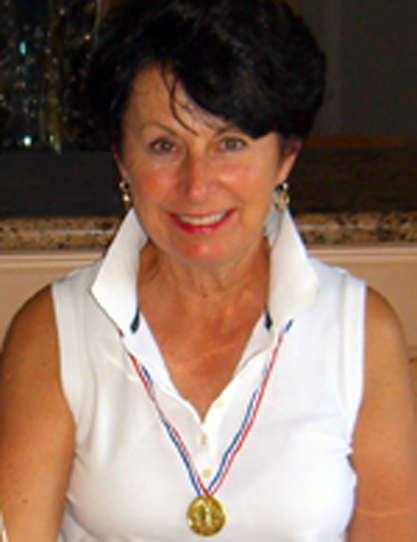 Jayne just joined our ambassador family representing the Naples, Fl area. Please extend her a very warm welcome! "I retired in 1995 and during my retirement years have enjoyed playing tennis and golf about every day. One day while golfing, I mentioned to the existing club President, Bruce Warren, that we needed to get some activity on our underused hard tennis courts. Like myself, most players were playing on har-tru courts and no longer wanted to play on hard courts. I told Bruce that I had seen this game called Pickleball at the Villages, and it might be a good idea to start it at our club, Lakewood Country Club of Naples. He encouraged me to give it a try, and the rest is history. I went on line, learned how to play, and then contacted Bob Taylor, ambassador from Anna Maria Is/Bradenton, FL , who sent four experienced tournament level players from Anna Maria, (Bill and Val Wilson, Jim and Toni Teasdale) to our club to do a demonstration for us. That was three years ago when we had one taped court that I personally taped, and about six inexperienced players. Since then, the Board of Directors has approved the painting of four courts and the purchase of nets and equipment. We now have 30 plus players in season, some of whom have already won medals at local tournaments. Pickleball has breathed new life into our club! This past season we had "open" play every weekday at Lakewood CC and "scheduled" play on the weekends. We also hosted two Invitationals with club members from Silver Lakes, Naples and the Marco Island Racquet Club coming to Lakewood CC to enjoy several hours of arranged play for fun and friendship. We invited the 3.5-4.0 ladies tennis group from The Lely Players Club and Spa to an "Introduction to Pickleball" afternoon. We plan to have many more interclub events in the upcoming season. In addition to playing at the Lakewood CC , I'm also a pickleball member at the Marco Island Racquet Center and recently was instrumental in helping the players there convince the city to install two more much needed courts with nets. My husband Harry and I had split our time between Naples, FL and York, ME before becoming year round residents in 1998. Although Harry, as yet, doesn't play pickleball, he's an active supporter of the game and assists me in every effort and event that I get involved in. We have three sons and six grandchildren, and hope someday they all will be pickleball players. My goals for the 2012-2013 season are to increase our player numbers by offering more times for organized play. I would like to schedule three to four clinics, with local area teachers, at LCC to help all players improve their skills and knowledge of the game. I would very much like to get more players involved in participation/attendance at local pickleball tournaments. Intergenerational play involving seniors and our local school age children is also one of the projects on our agenda. In my new role of official ambassador, I will encourage all players to become USAPA members in order to take advantage of all that's available through the organization. Greater USAPA membership means more support for this game we all love and enjoy. Starting a pickleball program has been so incredibly rewarding. It's been worth all the hard work, and watching everyone have so much fun and get great exercise at the same time is just simply the best!!! " So happy to read about your love of PB and about the activity at Lakewood. I am in Northern Georgia, where I play a couple of times a week, but will be returning to Naples in November. I have been searching for other PB players in Naples but have not had any luck until now. I will contact you upon my return.